With this small device mounted between your motor encoder's PC board and it's mating cable, you can verify or adjust the output duty cycle for proper operation. It measures the duty-cycle in real time and changes colored LEDs to indicate how to adjust the encoder (details below). For 8", 10", and 12" LX200 "Classic" telescopes. Colored LEDs easily show which direction (CW or CCW) to adjust potentiometers on encoder board. Indicates "green" when outputs are at desired duty cycle (45-55%). Takes only minutes to install, calibrate, and de-install. No special instruments required. Can be used any time to check operation of the encoder boards. Priced at only $25.00* each. 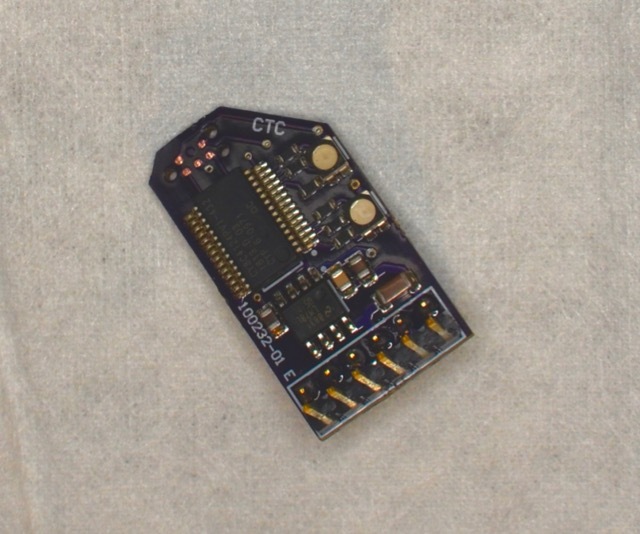 This small board plugs on to the encoder board's 6-pin connector, sitting atop the board but leaving space for a small screwdiver to reach and turn the potentiometers. There are two small LEDs visually aligned with the potentiometers, changing color depending on its measurement of the encoder output duty cycle. To calibrate the board you simply turn the adjustment in the direction the color of the LED tells you to. If the color is blue, turn clockwise, if yellow, counter-clockwise, until the LED turns green. To install, you will need to gain access to the encoder board (different procedure for DEC vs. RA), pull off the 6-pin connector, attach the calibration tool to the vacant 6-pin header, then attach the connector to the calibration tool. The tool sits electrically between the encoder board and the telescope's main board, where it can see and measure the motor board's quadrature output signal. The calibration tool will begin monitoring when the telescope is slewed at the "Find" speed. See the instructions for complete information.